In an interview with Indo-Asian News Service, Manick Sorcar had expressed a desire to pay tribute to two great men of India, Swami Vivekananda and the legendary magician P. C. Sorcar with laser. This was to celebrate the 150th birth anniversary of Swami Vivekananda and the birth centenary of his father, the Great Sorcar. Chicago: Indian American Manick Sorcar who has devised a laser show to pay tribute to two eminent Indians, Swami Vivekananda and magician P.C. Sorcar, says he is only repaying his debt to them. Manick is the son of the famous magician and combines his day job as a lighting engineer in Denver, Colorado, with a passion for art and laser shows. The year 2013 is the the 150th birth anniversary of Swami Vivekananda and the birth centenary of Sorcar's father, which he considers a happy coincidence.
" Swami Vivekananda has been an inspiration all my life, particularly in teaching me to arise, awake and stop not till the goal is reached. My father, for whom I did all the lighting and art work backstage for his magic shows, has been the main source of inspiration in mixing art with science. Both men have played an important role in shaping my life of which what I am today," Sorcar told the sources. He said he had a great interest in doing a laser documentary on Swami Vivekananda. "My research started in 2005 when I visited the Art Institute in Chicago where Swamiji gave his inspiring speech (at the parliament of the world's religions in September 1893). I was subconsciously looking for his footprint. "After searching the drawings, I could trace the exact spot where he had exactly stood to give the speech, and I found this discovery thrilling. Last year, when I received an invitation from the Ramakrishna Mission to do a laser documentary on Swami Vivekananda, my dreams came true," Sorcar added. The two-hour laser programme is divided into two parts. "The first hour is dedicated to Swami Vivekananda. 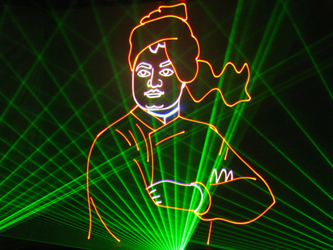 This is preceded by a "laser live" prayer-dance based on a work of Swami Vivekananda. 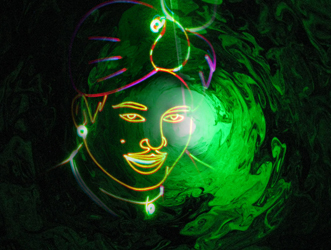 The second half is a laser show celebrating the centenary of my father, with laser applied to his magic," Sorcar said. He will also display his multi-media artworks on his father. They range from kaleidoscopic watercolours from his school days, acrylic paint, spice and seed-art, to laser art. "Swamiji" premiered last October 10 at the Grand Theatre of Science City in Kolkata. Sorcar said while he was deeply grateful for the critical acclaim, what touched him was the appreciation from the monks of Ramakrishna Mission. "Vivekananda taught me no great work can be accomplished with gimmicks or publicity stunts. From my father, I learned stage art. To all that I have mixed my fine art and practical experience and educational background in electrical engineering and lighting. Laser is state-of-the-art in lighting, which I have mixed with live action on stage and tamed the dangerous light-beam to act as a harmless paint brush," Sorcar said. Sorcar, who has won several awards in the US for his laser art, brought the technology and helped to build a laser animation laboratory for "Laser Lighting for Art and Animation" at Jadavpur University, where it is now studying towards a degree in electrical and illumination engineering.